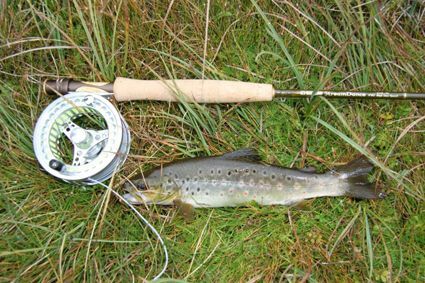 Some great reports have surfaced from the weekend and with good weather overall the weekend was a fishing success for many. *Hey Tom,As discussed, a photo from our trip this week. Only a little bugger but still  the first fish for my new rod and taken on a nymph I learnt to tie from a Mick Hall video the week prior. Awesome. *Bill Foster, Ray Vicary and Carla Krijnen had a fish on the Eucumbene river on the weekend and caught four fish between them. Nothing outstanding size wise but plenty fish rising and moving about the pools. No flies were lost! *John Herzog, Pepe and John's mate from Sydney had a great weekend catching over a hundred rainbows between them. Best method was intermediate lines fished loch stlye from the boat with small beadhead nymphs. 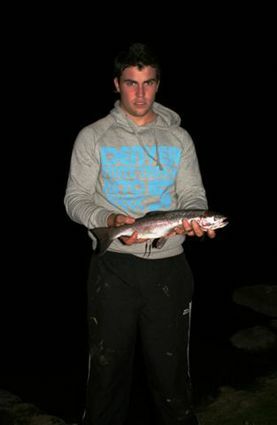 *Matt Daniel had a good evening session at Seven Gates recently catching eleven fish for the night. Best rainbow was around the 1.5kg mark. Mudeye patterns and Fuzzy wuzzy were the best flies. 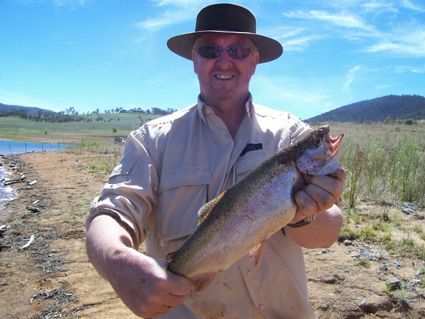 *One good report this week was midday fishing in the main basin with flatline dual depth tassies in YFR and 74. A quick report for Good Friday and Saturday at Jindy. Arrived at the Kalkite boat ramp around 6.20am. Put the boat in the water and headed straight to the western side and put the Tassies in the drink and started trolling towards the township. Only trolled around a 1km up and headed back the other way. By 7.30am my mate Larry already had 5 rainbows in the boat all between 1 1/2 to 1 3/4 pound. Not long after things basically stopped so we put on the leadcore and had no luck. So we set up camp and had a beer and a rest before the arvo session. About 5.30pm we headed to waste point where I proceeded to lose something massive. It hit like a freight train and peeled somewhere near 40metres of line before I got about 10metres back, only to lose another 30 before it broke me off. I had never seen a reel lose line so quick before. Just on dark we headed back to camp with 2 small rainbows which were released. Saturday morning we were on the water before sun rise and fished both of the areas we did the day before. This time I got in on the action and managed a healthy 2 pound rainbow and ten minutes later a 5 1/2 pound brown. It was in great condition and had a ball with it. Things quietened down so we headed up near the pipeline past waste point where I managed another 2pound brown and Larry another Rainbow. Finished fishing on the saturday around 10.30am and headed home after a having fun landing a few fish. First time Larry had landed 5 trout in a single trip so he was stoked. All the fish caught were on No 36 Dual depth Tassie and despite dragging other yellow wings around none of the others got a touch. 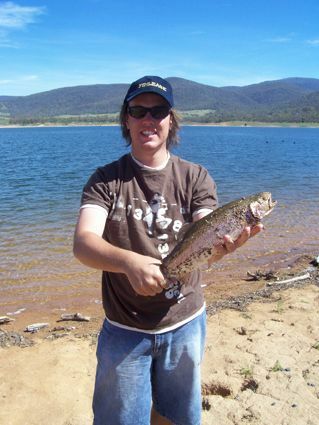 We fished the Jindabyne area last week for a dozen fish or so. Notably we did not get ­one on the troll despite trying just about every lure in the box on the downrigger and on the flat troll. Heaps of fish on the sounder off waste point. We did however manage to get a couple on the rainbow powerbait, spinning with yellow wing Tassie devils from the boat and the shore with Celtas and big eyes. In the rivers we saw plenty of fish and land a few on dry flies and a couple on small Rapalas. Seems a small number have fish have moved into the Thredbo but are VERY difficult to distract from natures call. Steve, Mark, Arthur, Luke and Wayne. *Four anglers had a great session in the Middilingbank arm over the weekend with 25 fish being landed. Lemon and Lime twist were the Powerbaits that worked. The boys had it all grubs, mudeyes, scrubbies etc yet the old standby Powerbait was still the go. Jindabyne has been much better over the weekend. 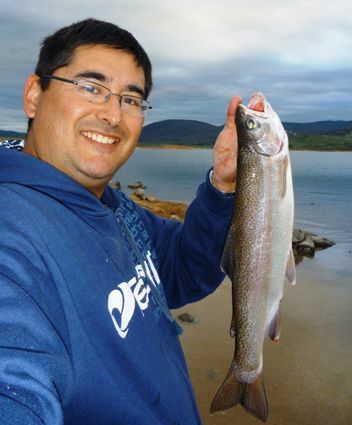 Will Shafron from Canberra caught this 1kg rainbow trout at Curiosity Rocks Jindabyne 8pm on Good Friday 2 April on a reel and rod using a fresh mudeye from your shop. Fished Kalkite on Good Friday from 3 pm till 10 pm. Got my first rainbow for 2010 at 6.15 pm, then another at 7.45 pm. Both weighed around 850 grams caught on 1 kg mono using sherbert powerbait. The rods hardly bent when they took the bait and didnt ring the bells on the rods. While I was reeling them in, they kept running towards the shore making me think I got busted off, only to make a sudden run back into the lake once Id wound up the slack. Could hear the odd fish jump during the night and had to keep rebaiting my lines but not much else happened after I caught my second fish. Mudeyes Grubs, and Powerbait will be the pick there.